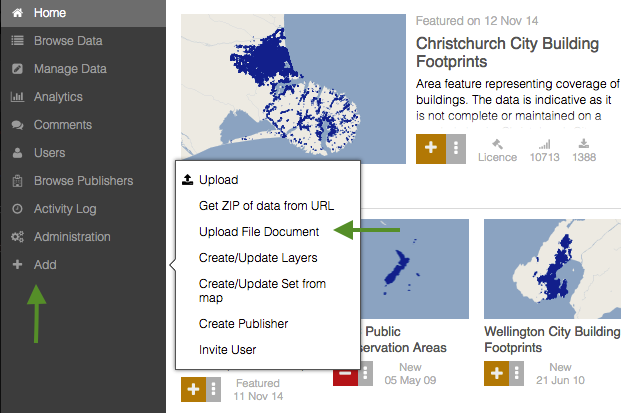 The process for uploading documents is similar to the manual upload process for datasets. Select Add from the main menu on the left side of the screen, and then click Upload File Document. This will allow you to browse for a file on your hard-drive to upload. Title: Rename your document, or keep the default provided by Koordinates. Owner: Decide which group or individual will be owner the document. Only the owner of the document will be able to remove it from the site, and set administrative privileges. Availability: Decide if your document will be directly downloadable by anonymous users and search engines. Description: A field to describe the document for users. Category: Choose the category to which the document will belong. This will help users find your document. Licence: Choose how the document shall be licensed. If you choose ‘Creative Commons,’ you will be asked to decide which Creative Commons licence applies to your work. Location: Decide the location to which the document will belong. This will help users that are filtering search results by location. You will then be taken to the About page for your document. This will include the information you have provided, as well as page numbers and file size, both of which are automatically calculated by Koordinates.